TSN Hockey Insiders Bob McKenzie, Pierre LeBrun and Darren Dreger joined host James Duthie to discuss the next World Cup of Hockey, early season trade rumblings out of Montreal, how Tom Wilson is dealing with his suspension, the latest on William Nylander and ticket sales for the 2019 World Junior Championship. The last World Cup of Hockey was in 2016, so the natural calendar would suggest that our next one should be 2020, but their might be a little bit of an issue with the CBA. How do they deal with this, what are the possibilities? Pierre LeBrun: The key thing is that they’re finally going to have to deal with it, I think they’ve been really not digging into this until now. Both sides agree that by early January they have to decide once and for all, are they going to put in the work and agree on a World Cup for 2020. The NHL in particular does not want to do an ’04 where they had a World Cup and then they turned off the lights and locked out the players the next day, they don’t want to do that again. How do you avoid it? All kinds of ideas are being floated out there, could you change the timing of the reopener for the CBA? Could you extend the CBA? Could you get going on CBA talks? There are a lot of different things being talked about, a larger international calendar, Olympics, it’s an interesting time because they may end up just doing a one off and agreeing on this one tournament, but maybe it leads to something bigger. We’ll see. Darren Dreger: The international calendar was recently discussed in a meeting in New York City. The meeting was called by IIHF president Rene Fasel, Bob Nicholson was there representing the IIHF, Bill Daly and Gary Bettman from the National Hockey League and Don Fehr of the National Hockey League Players’ Association. They of course talked about the Olympics and the players remain adamant that they need to be in China, but there are some in this group that are concerned with the political friction that exists between Fasel and IOC president Thomas Bach, so we’ll wait and see. Early season trade talk has become a rarity, but could Montreal open things up early? 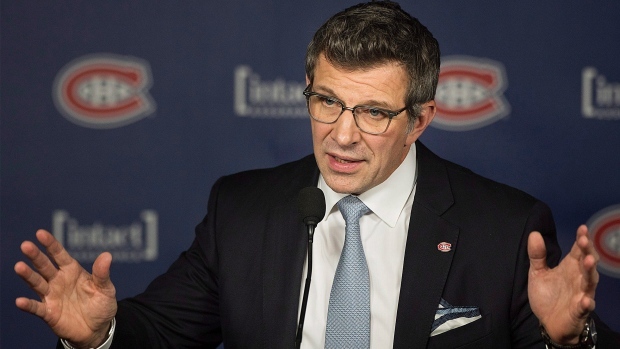 Bob McKenzie: Montreal Canadiens general manager Marc Bergevin has let his 31 general manager colleagues know that he is available for business in terms of potentially trading a forward. On any given night, Nikita Scherbak and Tomas Plekanec have been healthy scratches sitting in the press box and with Nick Deslauriers soon expected to come back off injury as well as Jacob de la Rose, the Canadiens could have 16 healthy forwards. Somebody could go down on waivers, but they may also lose somebody for nothing, so Marc Bergevin is being a little preemptive here and saying, hey, if you want to talk about one of my forwards, give me a call. Tom Wilson of the Capitals is, of course, appealing his suspension, but either way he has a lot of time to think. Is he spending that time thinking about his game and all of these hits that keep getting him suspended? Dreger: Yes he is absolutely, he’s dissecting video, this guy is a student of the game, he’s always been that way. He doesn’t just look at his own hits and suspensions, he looks at hits around the National Hockey League. He’s working out, he’s practising with the Washington Capitals, but he knows that he has to learn to adapt. They felt like he did that after his boarding suspension last year and they’re confident he’ll do it again this year. You have to keep in mind, he’s a very physical guy who averages more than 250 hits per year. We’re mid-October now and it’s still crickets and tumbleweeds on the William Nylander situation, where are we, if anywhere? LeBrun: Still not very close is what we’re being told and you wonder how it got here. For one, both side have not really moved from their opening position, I think the Leafs opened around 6x6 ($6 million a year for six years) and we know the Nylander camp was over $8 million a year, so a big gap there. Here is why it’s important for the Leafs, I think, to not really go much north of $6.5 million a year, if they do get there and I think they will. Any dollar north of $6.5 million impacts what they can do in terms of Auston Matthews and Mitch Marner on their extensions. This isn’t philosophical towards Nylander from the Leafs, I think it’s just a mathematical thing with the salary cap. On the flip side, if you’re William Nylander there is a concern that if he signs in the ($6 million range) which is way below what he wants, then he gets traded because he can’t get a no trade clause in this deal and then he gets overlapped pretty significantly by a Mitch Marner deal next summer. Lots to chew on from both sides and right now, not very close. Two-and-a-half months away from the World Juniors, saturation in Ontario the last few years they had some ticket issues, particularly in Buffalo last year. Not the case in B.C. this year.